Marek Holecek and Tomas Petrecek progressed “a bit further” from their August 11th bivouac (at 7300m), but are stuck again due to bad meteorological conditions. They wrote that wind has been so fierce that it almost flew away their tent, while temperatures dropped to -30°C. However, the duo is eager to wait out bad weather and resume the ascent. “The weather isn’t helping us but we will still fight,” they messaged from their new bivouac today. Though, Mountain-Forecast predicts good weather no earlier than Tuesday. It has already been more than a week since departure of Czech climbers from Base Camp. On August 11th, they were at 7300m awaiting improvement in weather conditions to proceed further. Based on weather forecast, they were expected to resume the ascent on August 13th. Czech team left Base Camp on August 7th, hoping for good weather and better climbing conditions on the wall. They intended to complete the ascent in 7 days. 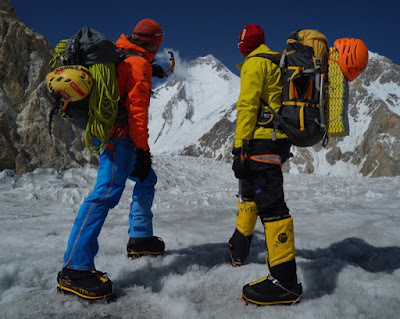 Marek and Tomas’ line of ascent - a direct route up the Southwest Face of GI - has been attempted twice by Marek together with late Zdenek Hruby (in 2009 and 2013), reaching 7600m and 6800m, respectively.